https://www.londontheatre1.com/reviews offers reviews of London West End and Off West End productions from 2011 onwards. There are probably 500 reviews between 2011 and 2014. Last year, however, was a growth year in terms of the productions being reviewed. They have now 50 reviewers and there were over 850 productions reviewed in 2015 alone, in and around London – in the West End and Off West End. We have been offered a free trial of American National Biography Online until 11th Feb 2016. To access the trial, please go to the Library’s E-resources Trials webpage and select this resource from the list, or go directly to American National Biography Online, or simply search for American National Biography in DiscoverEd and follow the link http://discovered.ed.ac.uk/44UOE_VU1:default_scope:44UOE_ALMA51149999870002466 for the e-book entry. You can use Trial Feedback Form to send your comments. American National Biography offers portraits of more than 19,000 men and women — from all eras and walks of life — whose lives have shaped American history and culture. From astronauts to missionaries, chemists to musicians, and cowboys to Vikings, the portraits combine to reflect the rich diversity of American life, from pre-colonial times onward. More than a decade in preparation, the American National Biography is the first biographical resource of this scope to be published in more than sixty years. The Main Library has a full 24-volume set of the printed version of American National Biography which can be found in DiscoverEd. Two supplements are also on order. In 2013 we acquired Theatre in Video which contains more than 250 definitive performances of the world’s leading plays, together with more than 100 film documentaries, online in streaming video – more than 500 hours in all, representing hundreds of leading playwrights, actors and directors. This video resource can be accessed from the Database A-Z list or Databases by subject for English Literature. Now, we have been offered a free trial of Volume II of Theatre in Video which includes new, international, and contemporary performances; ground-breaking documentaries; and critical instructional series. The trial will last until 30th Nov 2015. To access the trial, please go to the Library’s e-resources trial site. Feedback welcome. Sadness from the National Film and Sound Archive of Australia (1999): Award-winning photographer William Yang explores issues of grief, family and identity in this adaptation of his acclaimed stage performance. Through this poetic montage of storytelling, photography and stylized reenactment, Yang brings to life the stories of his family and friends. Sweeney Todd from Image Entertainment (2001): The San Francisco Symphony Orchestra’s 2001 concert production of Stephen Sondheim’s musical is superb and (even without scenery) theatrically effective. The performers are in costume and use a few essential props such as Todd’s razor, but more than these details the quality of their singing and acting makes this production stand out. Features Tony Award-winners Patti LuPone and Neil Patrick Harris. Candide from Image Entertainment (2004): Leonard Bernstein’s comic operetta comes to new life under the guidance of director Lonny Price (A Class Act). Based on the classic Voltaire tale of an innocent young man’s journey through a life filled with colorful characters and unexpected life lessons, this production features Tony Award-winners Patti LuPone and Kristin Chenoweth. Modern Moliere: Tartuffe from TMW Media Group (2007): This contemporary version of Moliere’s classical comedy, Tartuffe, is the timeless story of a religious impostor who tries to steal his wealthy benefactor’s wife, daughter and fortune. Set in modern-day Los Angeles and told all in rhyme, Tartuffe comes brilliantly alive on screen. Shakespeare: Twelfth Night (Globe)** from Opus Arte (2013): One of Shakespeare’s best-loved comedies, Twelfth Night was ‘blissfully reborn’ (Telegraph) for the 2012/13 season at London’s Globe Theatre, under the direction of Tim Carroll. The tale of misdirection and deception is performed here by an all-male cast, among whom we find Mark Rylance as Olivia and Roger Lloyd-Pack as Sir Anthony Aguecheek. The production also marks Stephen Fry‘s return to the stage as the pompous Malvolio, ridiculous in his yellow stockings. Sado Tempest from John Williams (2012): Arashi mixes Japanese rock, Noh Masks, and the weird volcanic landscapes of Sado Island in a radical reworking of Shakespeare’s The Tempest. In this Tempest the storm has gone badly wrong and ruined the island, Caliban is now in charge, Miranda has gone crazy, and Prospero is missing – presumed dead. Black Theater: The Making of a Movement from California Newsreel (1978): Black Theatre: The Making of a Movement documents the birth of a new theatre out of the Civil Rights activism of the 1950s, ’60s and ’70s. Amazing Scenes from the National Film and Sound Archive of Australia (1980): Spike Milligan takes a look at the Australian fringe theatre scene and finds a colourful, somewhat offbeat array of talent, including David Argue, Cappriccios, Circus Oz, Clowneroonies (featuring Geoffrey Rush), and many more. Pram Factory from the National Film and Sound Archive of Australia (1994): In the early 1970s Melbourne was home to the Australian Performing Group, a theatre collective that quickly became a focal point for the intellectual, artistic and political life of those turbulent times. Shakespeare, India and Me** from electric sky (2012): In Shakespeare, India & Me, Felicity Kendal, one of Britain’s best loved actors, tells the story of India’s long love affair with Shakespeare, from the first days of Empire to Bollywood and beyond. Elaine Stritch: Shoot Me** from Smart Broad Films (2013): In her final years, Broadway legend Elaine Stritch remained as ferociously funny as ever, moving from project to project with unparalleled zest and zeal. This bold, hilarious, and poignant documentary reveals the uncompromising Tony and Emmy Award-winner both on and off the stage. Audition Series with Michael Shurtleff from First Light Video Publishing: Michael Shurtleff teaches an approach to acting that helps students learn to locate their own inner strengths and bring these strengths to bear with maximum energy and force in each role and each moment on the stage. Actor’s Notes** from Sound Venture: Following in the footsteps of our very successful series on ballet and classical music, this series examines the art of acting from the actor’s point-of-view. Hosted by veteran actor, Jennifer Dale, the series features interviews and performances by some of Canada’s greatest stars, working in a particular genre of acting: Feature Films, TV Series, Shakespeare, Musical Theatre, from Stage to Screen, and Comedy. Dreamers and the Builders: This sub-series examines the jobs of the creative people behind theater productions and considers their processes. It explores the various aspects of the work of actors, directors, playwrights, designers, and technicians and discusses the ways in which they work individually and collaborate. Business of the Theatre: This sub-series describes the business aspect of producing the play, how you raise the money to capitalize a play or musical, structuring budgets to account for pre-production and ‘running’ costs, and developing a marketing/publicity and advertising plan. 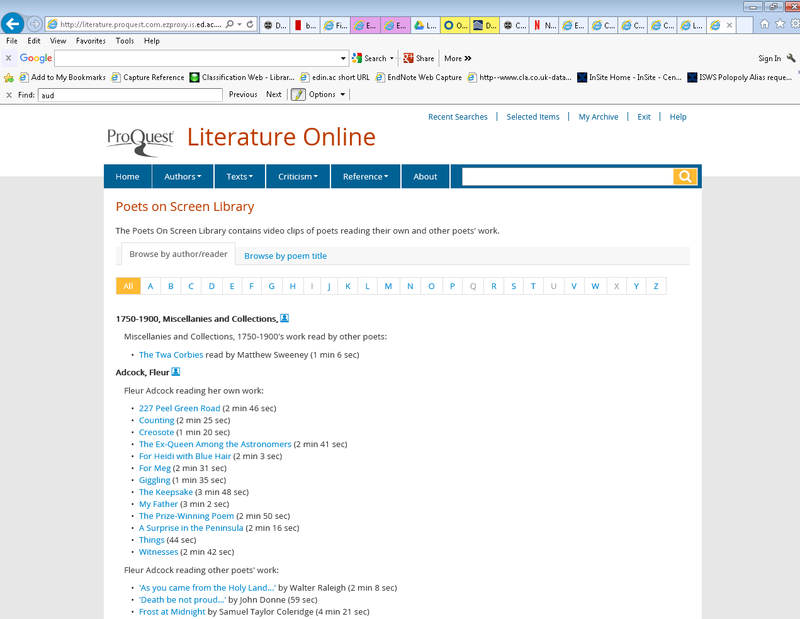 National Poetry Day : video clips / audio recordings of poets reading their own works from Literature Online! Today, Thursday 8 October 2015, marks the 21st anniversary of National Poetry Day. Why not watch some video clips or listen to some audio recordings of modern and contemporary poets reading their own works as well as works of others through Literature Online that the University Library subscribes to. Poets On Screen [880 clips] — 880 video clips of poets reading their own and other poets works. Poetry Archive Audio [921 poems] — 921 links to poetry readings at The Poetry Archive, containing high quality historic audio recordings of poets reading their own works.